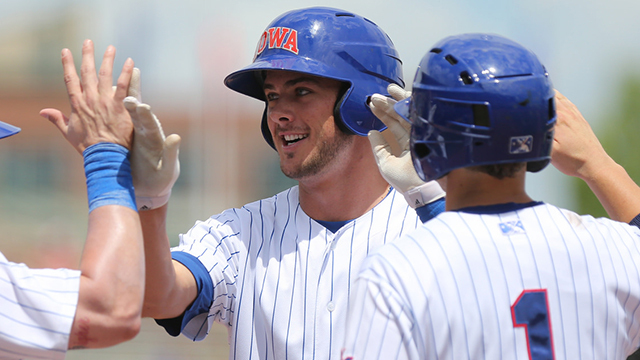 ST. PETERSBURG, Fla. - One extra trip around the bases was all Iowa Cubs third baseman Kris Bryant needed to dethrone 2013 home run leader Joey Gallo of the Frisco RoughRiders to become the Joe Bauman Home Run Award winner, sponsored by Musco Sports Lighting. Entering the last weekend of the season, Bryant was leading Gallo by two, and although Gallo was able to record one more home run on Monday, it wasn't enough to repeat. On Tuesday, it was announced that Kris Bryant's 43 home runs were the best in Minor League Baseball, naming him the winner of the prestigious award. The top regular season home run hitter in the domestic-based leagues wins the Joe Bauman Trophy and a check representing $200 for each home run he hit. "It is a tremendous honor to win this award," said Bryant. "I would like to thank the Chicago Cubs, the fans, my family and my teammates for supporting me throughout the whole season. I would also like to thank Musco Sports Lighting and Minor League Baseball for sponsoring this award. Congratulations to my good friend, Joey Gallo, as well as all the other contenders on their amazing seasons. It sure was a fun ride!" The Las Vegas native was selected by the Toronto Blue Jays in the 18th round of the 2010 First-Year Player Draft out of Bonanza High School but did not sign. Instead, he chose to continue his baseball career at the University of San Diego which led to him being a first-round pick (second overall) in 2013 by the Chicago Cubs. Bryant was signed by the Cubs on July 12, 2013. Bryant began the 2014 season with the Double-A Tennessee Smokies, where he knocked out 22 home runs with 58 RBIs and maintained a .355 batting average throughout 68 games. On June 19, Bryant made his Triple-A debut with the Iowa Cubs, where he continued his hot streak by adding 21 home runs, 52 RBIs and posting a .295 average over 70 games. The right-handed hitter is the first Minor League Baseball player to hit 43 home runs since then-Los Angeles Angels prospect Brandon Wood, who hit that many in 2005 while splitting the season between Class A Advanced Rancho Cucamonga and Triple-A Salt Lake. Bryant is no stranger to award-winning success. In 2013, the Cubs top prospect was named Player of the Week three times. During his 2013 stint in the Arizona Fall League, he was selected as a member of the Top Prospects Team, played in the Fall Stars Game and was named the league's Most Valuable Player. The right-handed hitter's success continued into the 2014 season when he was named Player of the Week three times, as well as a Southern League midseason All-Star. Bryant was also selected to play in the 2014 SiriusXM All-Star Futures Game held at Target Field in Minneapolis, Minnesota, on July 13. For his home run accomplishments, Bryant will receive the Joe Bauman Trophy, as well as a check for $8,600, which represents $200 for each of the home runs he hit during the 2014 season. The award presentation will be held during the Baseball Winter Meetings Awards Luncheon at the Hilton San Diego Bayfront in San Diego, California, on Monday, Dec. 8. Each classification leader will also receive a $500 award, provided that they are not the overall winner. In the event that two or more players finish with the same amount of home runs, their RBI totals are used as a tiebreaker to determine the winner. Erie SeaWolves' Steven Moya, who was recently promoted to the Detroit Tigers, was the top home run hitter in Double-A with 35. Class A was capped by Matt Olson of the Stockton Ports. The first baseman knocked out 37 home runs, beating out Inland Empire's Dennis Raben by six. Among Class A Short Season and Rookie-level players, Justin Chigbogu of the Ogden Raptors currently leads the Billings Mustangs' Aristides Aguino by four home runs for a total of 20. Jiandido Tromp of the Williamsport Crosscutters and Rowan Wick of the State College Spikes both have 14, followed by the Hudson Valley Renegades' Hunter Lockwood with 13. With two games left in the Pioneer League regular season, Aguino has the chance to catch Chigbogu; however, if he cannot do so, Chigbogu will be named the classification winner. The Pioneer League concludes its season on Thursday, Sept. 4. The award, first given in 2002, is named for Joe Bauman, who set a then-professional record with 72 home runs in 1954, while playing for the Roswell Rockets of the Class-C Longhorn League.